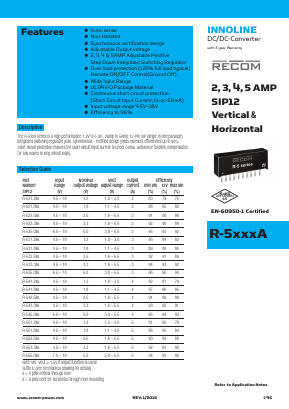 The R-5XXX series is a high performance 1.2V to 5.0V , 2Amp to 5Amp,12-Pin SIP (single in-line package) integrated switching regulator (ISR). Synchronous - rectified design yields excellent efficiencies up to 96%. Short circuit protection reduces the short circuit input current to under 50mA. Autosense function compensates for any losses in long circuit loops.